This Fall, Justice Douglas McKeon, the Administrative Judge of Bronx County, is heading up the Moore Advocates lecture series at Fordham Law School. This program features some of the finest and most successful trial lawyers in New York State lecturing about their field and demonstrating Trial Techniques to students and alumni of Fordham Law School. In addition to those who attended Fordham Law, the program is open to all practicing attorneys in New York. 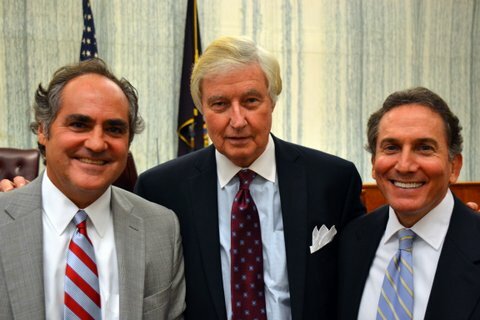 On September 12th Ben Rubinowitz and Evan Torgan joined Justice McKeon in speaking about Direct and Cross Examination. “Not only does Judge McKeon run one of the busiest Courts in the country but he still manages to find time to share his expertise with students and lawyers” said Rubinowitz. “I am delighted to have been asked to participate in the Program. It’s programs like these that make the Bar of the State of New York that much better.” Future speakers include, among others, Judy Livingston and Herald Price Fahringer.